Keep the US military out of your country. Seeing the peace prize go to an organization that actually seems to have kept the peace is cheering news in a month that witnessed the military of one former Nobel laureate destroying a hospital run by another winner. Doctors Without Borders (Médecins Sans Frontières) certainly earned its 1999 Peace Prize by providing medical services to people in more than 80 countries, often working in some of the most dangerous places on earth. On the other hand, as far as anyone can tell, a weary Nobel committee gave Barack Obama his prize in 2009 mostly for not being George W. Bush. 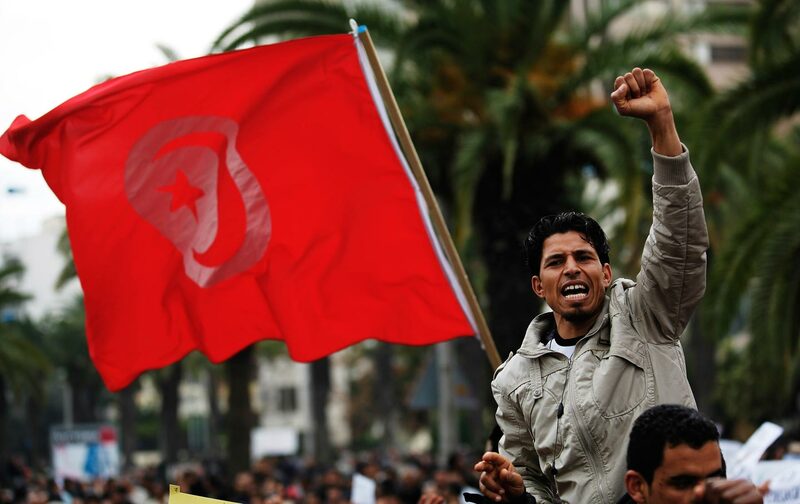 Tunisia, home of this year’s winners, is the country where the Arab Spring began when a vegetable seller, Mohamed Bouazizi, burned himself to death after the police confiscated the cart from which he made his living. His lingering death catalyzed a variety of social forces demanding an end to the US-backed dictatorship of Zine El Abidine Ben Ali. These included young people, students, and workers—all with deep economic grievances—as well as human rights supporters and some Islamists who hoped to see the country adopt a version of Sharia law. On January 14, 2011, 10 days after Bouazizi’s death and under popular pressure, Ben Ali gave up power and accepted asylum in Saudi Arabia. In October 2011, Tunisia held parliamentary elections. A right-wing religious party, al-Nahda (“Renaissance”), took 37% of the vote and formed a coalition government with two other parties, one on the left and the other composed of secular liberals. Hamadi Jebali, a solar energy scientist and member of al-Nahda, became the first prime minister. He later stepped down when fellow party members pressured him to abandon his efforts to build a coalition government of national unity in favor of a more explicitly Islamist approach. In the following years, while the al-Nahda party continued to rule, several prominent left-wing politicians were assassinated, for which the far right-wing Islamist militia Ansar al-Shariah claimed responsibility. Unhappy with the Islamist turn of their revolution and furious at what they saw as the government’s inaction after the assassination of leftwing Popular Front politician Mohamed Brahmi, Tunisians once again took to the streets. There, as Juan Cole wrote shortly afterwards, they staged “enormous demonstrations.” Unions, women’s organizations, and student groups all demanded that al-Nahda step down in favor of a more neutral, technocratic government. At this point, the profound political conflict in Tunisia could easily have turned into an armed confrontation. But it didn’t. Instead the country’s organized political forces, aided by the National Dialogue Quartet, achieved something remarkable, especially in the context of the present Greater Middle East. Al-Nahda withdrew from governing and was replaced with a “technocratic” caretaker government. Under it, a new, secular constitution was written and, in October 2014, parliamentary elections were held, followed by presidential elections that November. Today, Tunisia continues to face economic and political problems, including two separate terrorist attacks on foreigners this year, but for now it has something unique among the Arab Spring countries: an apparently stable, democratic government. Of all the countries touched by Arab Spring uprisings, including Egypt, Bahrain, Libya, Yemen, and Syria, Tunisia is the only one that has neither devolved into vicious internal warfare nor reverted to authoritarian rule. What makes Tunisia different? In Tunisia, as Juan Cole has suggested and the Nobel committee recognized, a uniquely strong, organized, and varied civil society, especially trade and student unions, was key to the country’s transition from dictatorship to democracy. There were other differences as well. Unlike the Egyptian army, which had long supported the Mubarak regime, Tunisia’s relatively small military was never tightly allied with the Ben Ali government. And, as Cole says, almost uniquely in the region, its commanders chose to stay out of the ensuing turmoil. Egypt’s military, however, thanks in part to US aid, is among the 20 most powerful in the world, and has long played a central role in that country’s politics and economy. After the Arab Spring protests in Cairo’s Tahrir Square brought autocrat Hosni Mubarak down, the first elections put a religious party, the Muslim Brotherhood, in power. However when (as in Tunisia) Egyptians started to grow restive under the Brotherhood’s rule and returned to the streets in protest, instead of allowing a transition to secular democracy, the military chose to reinsert itself in political life, elevating the head of the armed forces, General Abdel Fattah el-Sisi, who now serves as president and supreme military commander. Among other differences with the rest of the Arab Spring states, Tunisia is a country, rare in the region, with a certain religious homogeneity: more than 99% of its population is at least nominally Sunni Muslim, so it has not experienced the sort of sectarian violence that has roiled countries like Iraq, Syria, and Yemen. And as Cole also points out, when Tunisia’s secularists came to power, unlike the Sisi government in Egypt, they did not outlaw and repress the country’s religious parties. There is one more key difference to mention: since the revolution the United States has largely stayed out of Tunisian affairs. Admittedly, US military aid did rise from $17 million before the revolution to $29.5 million in 2012 before dropping again to almost pre-revolutionary levels for the next few years. Perhaps in response to the growth of Islamic State adherents, however, the United States recently announced that military aid to Tunisia would triple in 2016. We know that British special forces have been sent to Tunisia and it’s certainly possible that US special forces have been there as well. Egypt: Egypt has long been one of the world’s biggest recipients of US military aid, second only to Israel. When el-Sisi came to power, the Obama administration briefly withheld aid, but in March 2015 restored the full $1.3 billion a year it had slated for the Egyptian military. In fact, in 2013 when that army overthrew elected President Mohammed Morsi of the Muslim Brotherhood, President Obama took care never to describe this action as a “coup d’état,” because US law would then have prohibited any military aid to Egypt. In other words, after Tahrir Square and the Arab Spring rising, Egyptians essentially traded one US- and military-backed regime for another. Yemen: Ali Abdullah Saleh had been president of Yemen for 33 years when Arab Spring demonstrators took to the streets of the capital, Sana’a, at the end of January 2011. Between 200 and 2,000 died in the crackdown that followed, but by November Saleh was out, replaced by one of his deputies, Abdrabbuh Mansour Hadi, who has since been ousted by the Houthi rebellion. What could possibly make this situation worse? How about US-supplied missiles and cluster bombs delivered by the Saudi air force? Washington, of course, long ago made Yemen part of its battlefield in the “global war on terror,” using “kill lists” to send drones to pick off Al Qaeda terrorists (who might well turn out to be Yemeni civilians shopping for supplies to celebrate the end of Ramadan or getting married). Now, the United States has rushed to support Saudi Arabia’s intervention against the Houthis in the country’s hydra-headed civil war, providing munitions, intelligence assistance, and even mid-air refueling for Saudi bombers, while a naval blockade of the port of Aden has helped shut off supplies to the country. Seven months of sustained Saudi bombing, violence, and food and fuel shortages have helped displace more than a million and a half Yemenis. In August, the UN’s World Food Program warned that the country faces famine. The United States has been involved in Yemen for a while. In fact, when announcing the restoration of Egyptian military aid, the Obama administration stressed the importance of el-Sisi’s cooperation in the fight against Al Qaeda–style Islamic terrorism, particularly in Yemen (and also Libya). Now the United States finds itself in tactical agreement with these same Sunni fundamentalists. In a case of intervention making strange bedfellows, by supporting the Saudis against the Houthis, Washington has ended up on the same side of this fight as the Islamic State, which has been using its usual terror tactics in an attempt to drive the Houthis out of Yemen’s capital. Libya: The Arab Spring came to Libya, too, when Libyans deposed Muammar Gaddafi, who had ruled the country since a 1969 coup. US relations with Gaddafi had been tense at least since 1988 when a terrorist explosion brought down Pan Am Flight 103 over Lockerbie, Scotland. In 2003, Gaddafi acknowledged Libyan responsibility for the bombing and paid compensation to victims’ families (although maintaining his own innocence in the affair). In the same year, Tripoli abandoned its nuclear weapons program and allowed international inspectors free rein in the country. Washington reached an accommodation with Gaddafi in 2006, ending all previous sanctions. Two years earlier, he had also made peace with the European Union (EU), and in 2010 accepted 50 million Euros from the EU in return for help preventing African migrants and refugees from using Libya as a transit corridor to Europe. However, in 2011, when it became clear that Libyans were threatening to depose Gaddafi, the Obama administration abandoned him, pushing NATO into military action. NATO launched a concerted campaign of airstrikes to cripple his military. Gaddafi died after a convoy in which he was traveling was hit by a US Predator drone and French jet fighters. Although accounts of his death vary, it seems clear that, when Gaddafi was left without protection, a crowd attacked and killed him. In reporting on his death, The New York Times presciently referred to “an instability that could trouble Libya long after the euphoria fades about the demise of Colonel Gaddafi.” Indeed, chaos followed, spilling into Mali and other countries as the Colonel’s weapons arsenals were looted and dispatched across the region as far east as the Sinai Peninsula and possibly as far south as Nigeria. In Libya itself, havoc ensued, along with civil war (or wars) and the rise of a branch of the Islamic State (IS). As in Iraq, Washington once again proved remarkably skilled at dictator-toppling, but significantly weaker on its follow-up. Today, post-Arab Spring Libya is a failed state, riven by violence, and “governed” by rival parliaments. In September 2015, the Times reported (with no apparent irony): “Libyans are struggling with a problem that typically emerges after a bloody regime change: how to reassemble a functioning country after its brittle, autocratic and repressive government has been fractured and replaced with warring factions.” This is a question the United States might have thought to ask before getting into the government-fracturing business. The CIA’s World Fact Book lists Bahrain’s form of government as “constitutional monarchy,” but it is hardly a democracy. Political parties are outlawed, and although one legislative house is elected, King Hamad bin Isa al-Khalifa appoints the prime minister, the cabinet, and the members of the judiciary. He or his sons occupy most of the highest positions. More than two-thirds of Bahrain’s Muslims are Shia, while the royal family and the ruling elite are Sunni. The Arab Spring reached Bahrain in January 2011. In the fashion of Egyptian demonstrators in Tahrir Square, Bahraini protestors occupied the Pearl Roundabout, a key intersection in the capital Manama, demanding the king’s ouster. Al-Khalifa responded by calling on his allies Saudi Arabia and the United Arab Emirates (UAE) for help. The Saudis responded by sending 1,000 troops; the UAE sent another 500. Together they routed the demonstrators and ended the rebellion. Syria: The Arab Spring in Syria began with small demonstrations in January 2011. These grew larger when people in the town of Dara’a came out to protest the torture of young men arrested for putting up political graffiti. By April, the government of Bashar al-Assad was using tanks and live fire to put down demonstrations. By July, demonstrators numbered in the hundreds of thousands. By the end of 2011, demonstrations had given way to armed conflict as a wide variety of rebel brigades with differing aims and loyalties began to fight back. Fighters on multiple sides, including the Assad regime, have been accused of war crimes—torture, summary executions, the barrel-bombing of civilians, and the use of poison gas. The Internal Displacement Monitoring Organization reports at least another 7.7 million internally displaced people, forced by the conflict to leave their homes. Of a population of 22 million, almost 12 million, more than half, have been made refugees. The New York Times reports that more than 200,000 Syrians—almost one in every 100—have been killed. In March 2015, the BBC put the figure at 220,000, and in August, the UN suggested that figure might even have reached 250,000. The ultimate goal would be a realignment of power in the Middle East, with Syria destabilized, a Hashemite king ruling Iraq, and a new regional alliance among Turkey, Jordan, and Israel. Perle & Co. brought this plan to the Bush White House, where the 9/11 attacks provided a pretext for the first step: removing Saddam Hussein. It would seem that the neocon dream of destabilizing Syria has been realized as well, even if not in the way they expected. When the 2011 uprising became an armed fight, the United States began supporting the “moderate” Free Syrian Army, initially with “non-lethal” assistance. Since then, the United States has sought to identify non-extremist Sunni Islamists to equip and set loose on the growing Islamic State, with results that would be comical if they hadn’t been so deadly and disastrous. On October 9th, the White House and the Pentagon admitted that the $500 million program to vet, train, and equip moderate fighters in Turkey and Jordan to be sent back to Syria had been an abject failure. The Obama administration’s new strategy, reported The New York Times, is “a revamped program that briefly screens Arab rebel commanders of existing Syrian units before equipping them with much-needed ammunition and, potentially, small arms,” as well as, it turns out, TOW anti-tank missiles. On October 12, the United States airdropped the first 50 tons of ammunition to these rebel groups, who presumably have been distinguished from the Islamic State, the Al Qaeda–linked al-Nusra Front, and other extreme outfits by those “brief” screenings. The official US position on Assad himself remains that his leaving power is a prerequisite for any peace settlement, but the Obama administration prefers to frame its intervention as a battle against the Islamic State. Confronting IS in Syria while also opposing Assad has proved problematic, to say the least. There may well be non-Salafist forces fighting the Syrian government, but much of the fight against Assad has been carried out by Al Qaeda affiliates like the al-Nusra Front, or by IS (when they are not fighting each other, that is). Just as in Yemen, the United States has, eerily enough, ended up on the same side as its supposed greatest enemies, Al Qaeda and the Islamic State. Meanwhile, the Syrian conflict has been made exponentially more dangerous for Syrians and the entire world by the intervention of Russia, which opposes IS, but supports the Assad regime. The last thing the country needed was to become the site of a proxy war between the United States and Russia. Suffice it to say that US intervention has in no way alleviated the suffering of the Syrian people, whether caused by Assad—to whose regime the Bush administration once sent people to be tortured—or Islamist groups like IS. The history of Nobel Peace Prize recipients is an odd one. The first winner was Jean Henri Dunant, the Swiss citizen who founded the International Red Cross and inspired the first Geneva Conventions. The Red Cross itself has won three times, Doctors Without Borders once. My personal favorite laureate may be the scientist Linus Pauling, who won twice, once for his contributions to the anti-nuclear movement and the other time in chemistry.